Bab El Khemis, Alley. Photo by Marco Massarotto, click for full credits. I just spent six days in Morocco to visit Marrakesh and I’m very thankful to the city (and the people I met there) for the pleasant time. Marrakesh is warm (it actually is, on December it’s about 25°C) in a Maghreb, unique way. We were living in a Riad (the typical Moroccan house with a central patio, the picture above is Derb Jdid, where our Riad was located) in the north end of the Medina (part of the Unesco World Heritage). We were close to Bab El Khemis, the Door of Thursday, day in which there’s a local low end Suq (market), a zone mostly inhabited by locals. 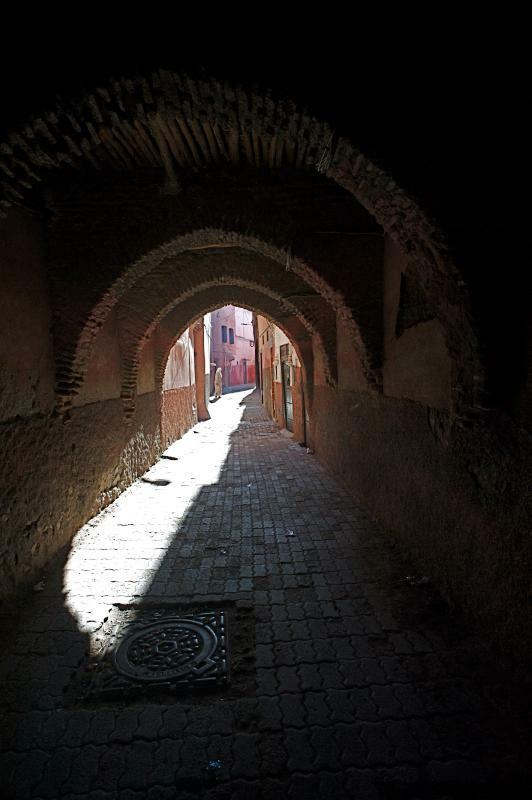 The very comfortable climate encouraged long walks getting lost in the Medina alleys, discovering a monumental neighborhood and getting everyday closer with the people. 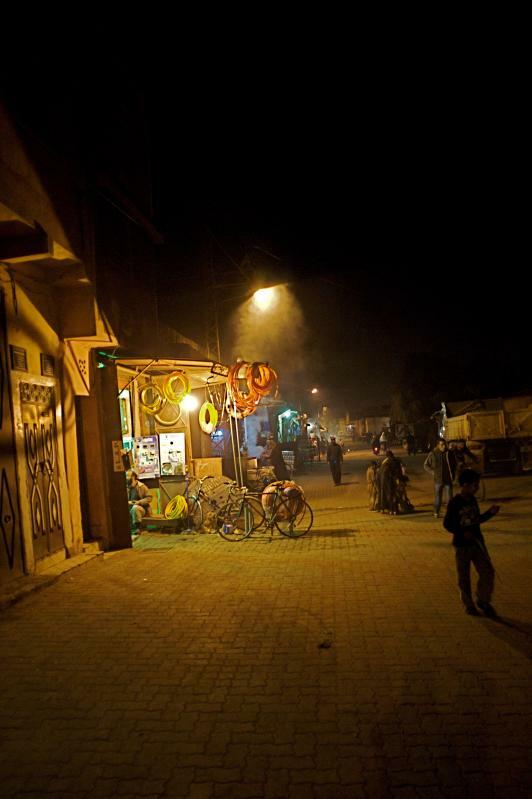 At first the Medina is a little bit scary: dark alleys, poverty, dirt. After a couple of days it grows on you and you actually feel you always lived in that kind of place and talk with everyone. 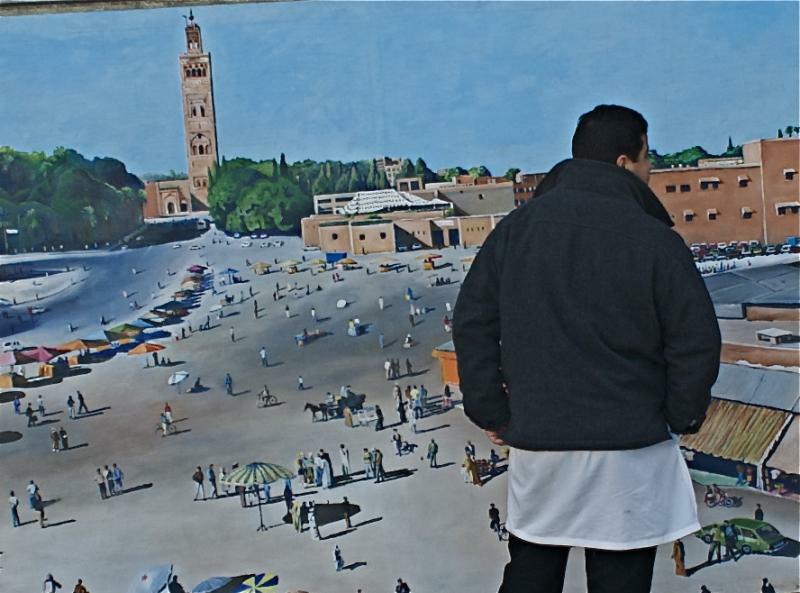 The Moroccans are friendly, honest, a bit pushy sometimes, but very pleasant people. 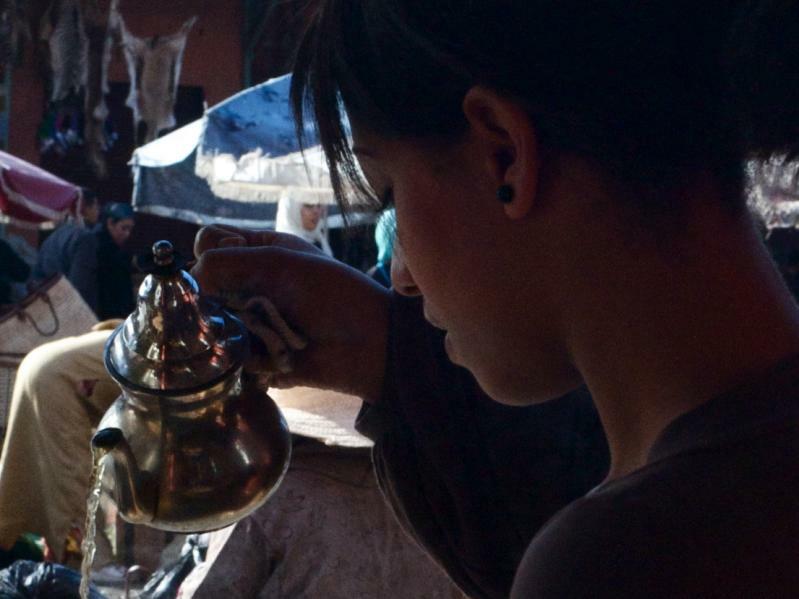 Street food is very popular in Marrakesh, so let’s cover that straight, starting from breakfast. 🙂 The chilly mornings didn’t scare me from a walk to Cafe Des Epices, at the Spice Market. Almost every morning I lingered there tasting a delightful Crepe Marocaine au miel (Squared, puff pastry crepes: videorecipe) and a fresh orange juice (oranges are so tasty there….) served by the young, beautiful girl working there. Sitting in the shadow of the Terrace of Cafe Des Epices is a perfect way to watch the Suq awaken and shape in front of your eyes. Thé à la Menthe. Photo by Marco Massarotto, click for full credits. 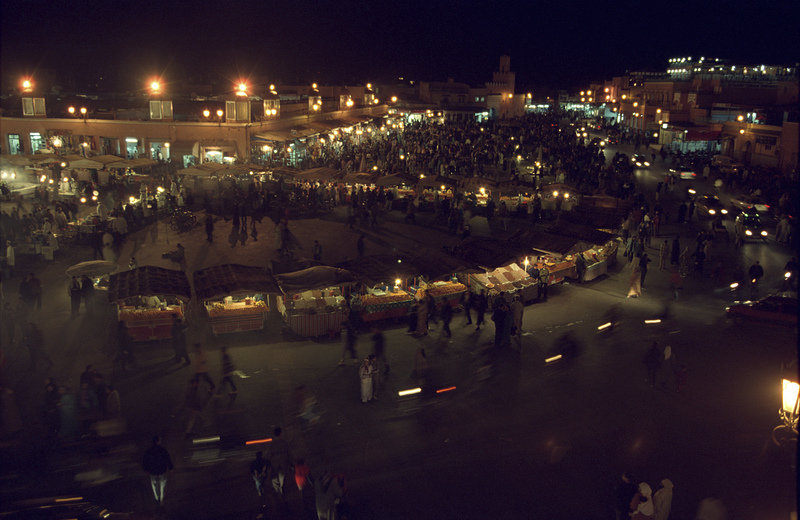 Marrakesh - Medina by night. Photo by Marco Massarotto, click for full credits. …unless you can afford carpets. The carpet market follows the spice market, and after that the leather market and others all the way down, down (everybody will give you directions, most of the time wrong) down to… La Grand Place, the big square, the beating heart of Marrakesh: Djema el Fna. Djema el Fna - Painting, photo by Marco Massarotto, click for full credits. 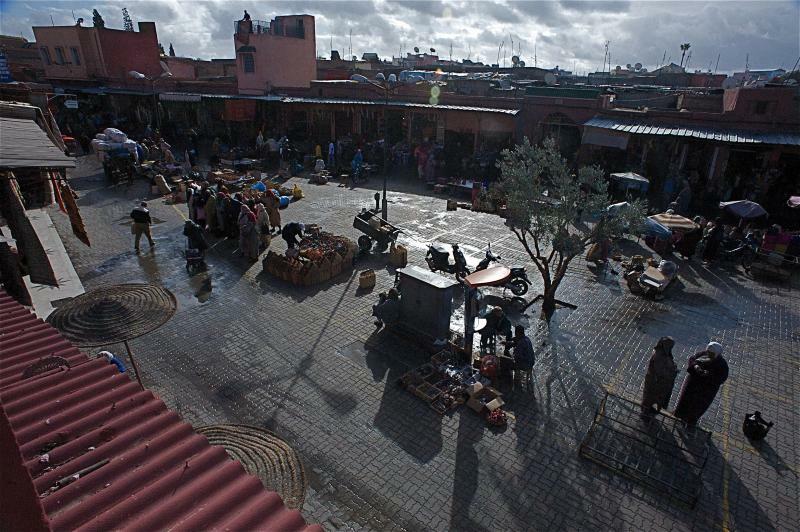 Djema el Fna is one of the world’s most famous squares and one of Africa’s largest and more active. In the morning terrace bars and stalls start offering fresh fruit juice along with every kind of item. As the day goes by Djema el Fna changes and becomes a huge open air restaurant with dozens of food stalls, a great view with amazing lights at sunset and a theatre with monkey and snake shows. 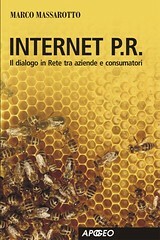 A unique experience of humanity. Food at this stalls is really fresh and tasty and it’s your best way into the Moroccan Cuuisine, made of grilled meat, rice and couscous with meat or fish, fried fish and all sorts of spicy, tasty, quick bites. Grab a seat at one stall (I suggest #34) and enjoy the moroccan flavours surrounded by the non stopping life of Djema el Fna: it will be a memorable meal. Moving south from Djema el Fna square, the Royal part of the city begins… but we will talk about that in the next post.